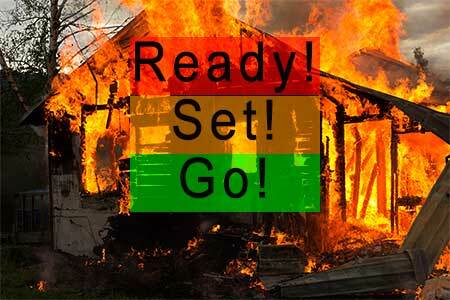 READY Evacuation means “Be Ready�? for potential evacuation. SET Evacuation means “Be Set�? to evacuate. YOU MUST PREPARE TO LEAVE AT A MOMENTS NOTICE This level indicates there is a significant danger to your area, and residents should either voluntarily relocate to a shelter or with friends/family outside of the affected area, or if choosing to remain, to be ready to evacuate at a moment’s notice. Residents MAY have time to gather necessary items, but doing so it at their own risk. THIS MAY BE THE ONLY NOTICE THAT YOU RECEIVE Emergency services cannot guarantee that they will be able to notify you if conditions rapidly deteriorate. Area media services will be asked to broadcast periodic updates. LEAVE IMMEDIATELY Danger to your area is imminent, and you should evacuate immediately. If you choose to ignore this advisement, you must understand that emergency services may not be available to assist you further. DO NOT delay leaving to gather any belongings or make efforts to protect your home. THIS WILL BE THE LAST NOTICE THAT YOU RECEIVE Entry to evacuated areas may be denied until conditions are safe. Area radio and TV stations have been asked to broadcast periodic updates.